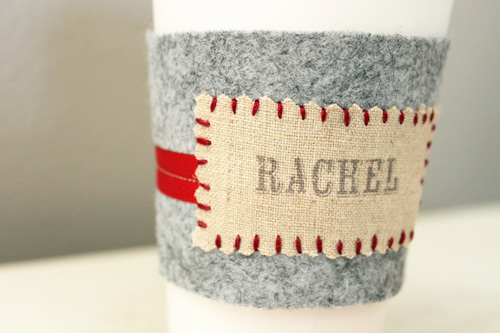 How adorable are these cup cozies I spotted on b*spoke. Love the vintage charm they bring to your morning cup of coffee or tea. These are sure to put some cheer into the holidays! 1) Trace cardboard cup sleeve onto felt, then cut along line. 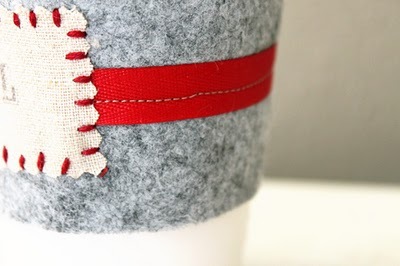 2) Use sewing machine to sew twill tape along the center of the felt. 3) Sew ends of felt together by overlapping slighting, then stitching up and down along the edge. 4) Print fabric tags, then cut with pinking shears, and hand stitch onto center of cup sleeve. 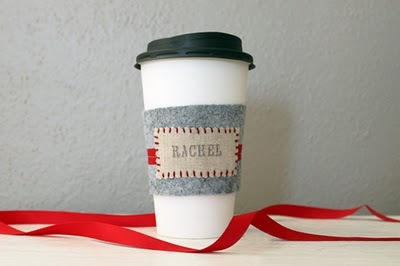 5) Slip the sleeve onto a coffee cup, and share the joy!